Learn to cook the best dishes The Philippines has to offer from some of it's best chefs with this comprehensive Filipino cookbook! 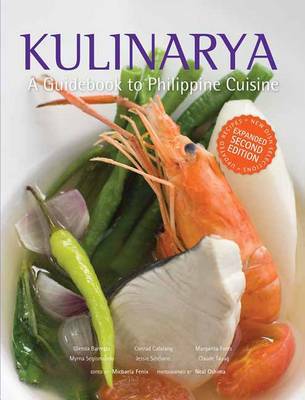 Kulinarya: A Guidebook to Philippine Cuisine, Expanded Second Edition, is the continuation of a movement to inspire homemakers, cooks, students, purveyors, retailers, and restaurants of all types to bring Filipino cuisine to the highest level of excellence in preparation and presentation for the world to appreciate. Authors and noted Filipino Chefs Glenda Barretto, Conrad Calalang, Margarita Fores, Myrna Segismundo, Jessie Seincioco, and Claude Tayag have succeeded in capturing the feel and essence of traditional Filipino cuisine through the Guidebook, which has become a staple of Filipino kitchens. Filipino recipes include: Beef Steak with Onions Deep-Fried Pork Belly Stuffed Crab Steamed in Banana Leaves Stewed Pork and Chicken in White Vinegar Rice Noodle Saute' Grilled Fish White coconut Custard And many more! This expanded second edition, with a more carefully-thought-out selection of recipes from classical and regional dishes, now with brilliant new photographs and, most of all, notes and tips from some of the best-kept culinary secrets. It is a must have for the experienced or new cook, a lover of Filipino food, or even someone who has never tried it before.